When everyone seems to shop online, why are 67.45% shopping carts abandoned? This is about people. Different people, different approaches! You may have made peace with the fact that you cannot satisfy every buyer. However, you can follow a certain set of established tactics to grow your international business to highest bounds. Experts keep telling you that localizing your global business is very important. It is, for two obvious reasons. To make people buy products from your online store. To keep people stuck to your store so they keep coming back. So, why do people want your international store to look and feel like their local online store? Because, this provides them a comfortable, easy to browse user experience. 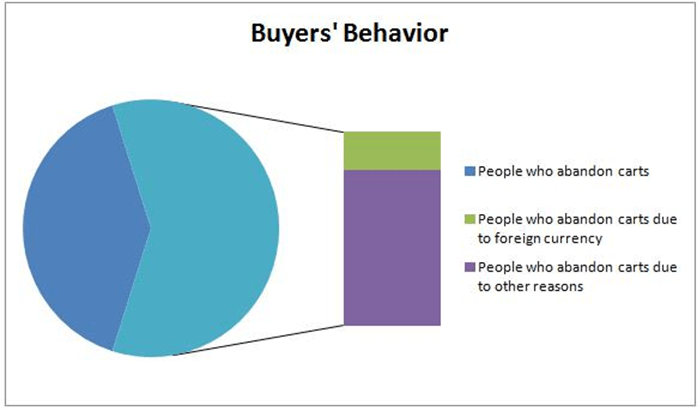 Research shows that 20% of people abandon their carts because price is presented in foreign countries. Of course, this is not the only motivation for localizing your store, there are many others. One being the headache of converting foreign currency prices unto your own currency, and other being the issue of its acceptance with banks. We have a solution for this problem, so let’s dive deeper into it. One thing is for sure- People want their buying experience to be simple and convenient. You show them product prices in foreign currencies. It is the feasible way since you are selling in multiple countries. Here you are ignoring one simple possibility. Not all the people may care about converting the price every time just to figure out how much they are paying. Also, all banks have different policies when it comes to accepting payments in foreign currencies. The return and refunds become another severe issue. Figuring out the amount is not the only problem. Sometimes it is about buyers feeling that they are paying more than they should. And it gets worse when your store is showing prices on products page in customer’s local currency. If the buyer saw a product’s price on product page in his local currency, and is all geared up to buy and went to checkout. How heart breaking it must be for him to realize that he has to calculate shipping rates and taxes on his own? Moreover, the psychological effect of this currency auto-switch is that they feel you are charging extra under the sheets of foreign currency. This is where the feeling of being deceived comes in picture. And a customer lost once, is a customer lost forever! There are many apps to show the prices on your store in buyers’ local currency. These apps critically locate buyers and show currency accordingly. But as soon as they proceed to checkout, the prices get converted into store’s default currency. You have to ensure that buyers see prices in their local currency at checkout. This can be achieved in many ways. The one obvious way is by establishing multiple stores. When you set separate store for each country, you can set currency under that country. Setting up and maintaining many stores come with its own set of issues as shown here. Shopify currently has no other app that lets you display price in buyers’ local currency at checkout. There are many apps that can let customers set currency on product page. Then at checkout page, the prices get converted to store’s currency. Hence, the ideal situation implies one store, one currency (store’s default currency) at checkout. Our mCheckout App lets you do one simple job of providing prices in buyers’ location currency at checkout page. Along with this, it takes care of refund and returns in the same currency previously used by the buyer. Also, you may wonder that for all the different currencies, you will need various coupon codes and discount offers. Wonder no more! All Shopify coupon and discount code generators are compatible with our app. How does our app work? It is important to note that the visible work of our app essentially starts from Cart page. At cart page, buyer gets two options in terms of currency. Either he can choose to proceed with store’s default currency or the alternate currency that was selected by the app (through location) or the user (manual input). The working of the app is not limited by just setting the price in particular currency. It also lets buyers pay in that currency. And why is this an added benefit? When users pay in foreign currency, they end up paying additional amounts to bank for foreign exchange. As mentioned above, not all banks support money exchange in all currencies. 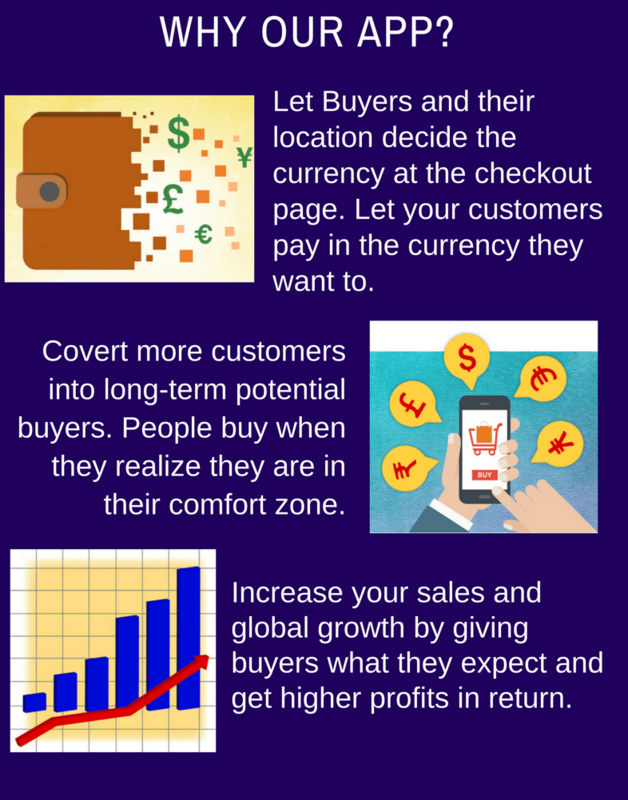 This serves as a hurdle in your store growth as it drives foreign buyers away from your store. But with our app, as you are offering them to accept payment in their currency, this issue is eliminated. 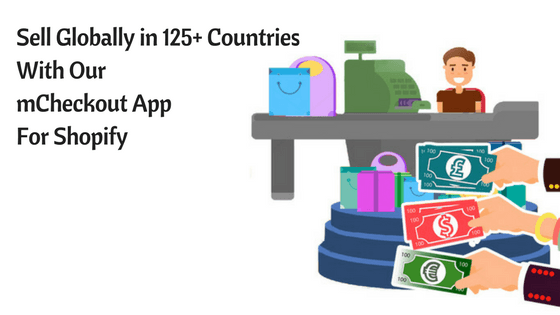 How can our mCheckout App help your international business? People are reluctant to buy when they see prices in foreign currencies. We provide you with an app that lets you set country wise currency at checkout. What’s more? If for once, a customer is hooked up at your store, he is bound to come back. This ensures long term buyers for your store. Let us know how you have been tackling this multi currency issue at checkout till now. And if you are still waiting for an ideal solution, use our app and convert more buyers today. If you have got any issues with our app, we are always here to help you. Nice article. Its realy nice. Many info help me. dont stop the super work!